Plants aren’t nearly as passive as their stationary state might lead one to think. They have similar immune system needs to animals, because they are routinely attacked by hungry microbes and larger creatures intending to munch their way around a leaf. And, like animals, they have ways of battling the ever-evolving attackers, that allow them to adapt to changing assailants. We've blogged recently about how plants communicate through their roots and in other ways (here) and about how they may even be altruistic (here). Here’s another interesting paper, in PNAS, about sophisticated responses and sociality among plants ("Intake and transformation to a glycoside of (Z)-3-hexenol from infested neighbors reveals a mode of plant odor reception and defense," Sugimoto et al.). 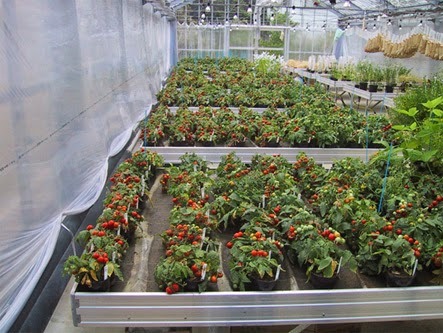 The authors report that tomato plants affected by cutworms produce a volatile chemical called Hex Vic ((Z)-3-Hexenylvicianoside) that diffuses through the air to neighboring plants. When the neighbors detect this, they then express genes that produce a substance that makes them resistant to cutworm attack, as well as weakens the worm. In response to herbivory, plants emit specific blends of volatiles. When undamaged plants are exposed to volatiles from neighboring herbivore-infested plants, they begin to defend against the impending infestation of herbivores. This so-called “plant–plant signaling” has been reported in several plant species. For example, a study on the expression profiles of defense-related genes when Arabidopsis was exposed toseveral volatiles, including green leaf volatiles and a monoterpene, showed that the manner of induction varied with the gene monitored or the volatile used, suggesting that the plant responses were specific to the individual volatile compound. Unlike defenses against microbial infection, this is a mechanism related to a mega-scale predator, an animal that is too big for the plant easily to defend itself, unless it evolves some form of toxin to kill the worms. Here, one might speculate about why plants under attack would help other plants, rather than just do their best to beset the cutworms on their own. Normally, one would say they ‘should’ (from a Darwinian perspective) raise their defenses as best they can, but not tip-off their neighbors, and hence competitors of the danger. Let them fend for themselves, and if they fail, the plant with the best defenses wins an evolutionary skirmish. Of course if the neighbors are clones from the same artificial domestic strain, as these appear to be (the authors say they are Micro-Toms, a hybrid strain), the evolutionary issues are moot, since whatever led to the plants' behavior didn't occur in a field of clones. So one wouldn't be able to say this evolved so they could help their close-kin neighbors in the usual sense. But if natural tomato seed dispersal isn't distant, then nearby plants would be close relatives, and the kinship argument might work, that the attacked plant may be harmed or even doomed, but by warning its neighbors it’s warning its kin. But, if natural tomato seed dispersal is distant, spread in the droppings of birds that ate the fruits, e.g., than the explanation must be something different. And indeed, if the volatile emissions are detected by non-kin, plants of other species, as Sagimoto et al. seem to suggest, below, then the kinship explanation doesn't work at all. Because (Z)-3-hexenol is a common volatile compound emitted by most herbivore-damaged plants, andbecause we found that a wide range of plant species could accumulate (Z)-3-hexenyl glycosides after exposure to volatiles, absorption and glycosylation of exogenous airborne (Z)-3-hexenol might be a general response in plants. In any case, here we have yet another example of a more complex living world than traditional understanding of botany has generally allowed. It's a reminder that we should curtail our hubris when it comes to assuming we higher animals do everything best.